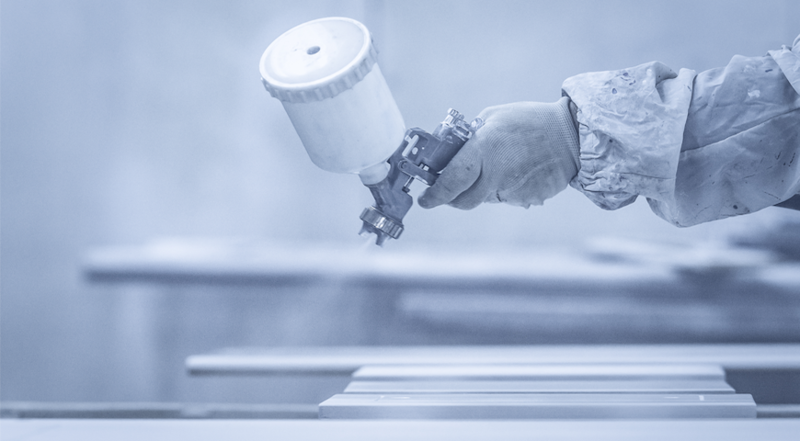 Paint booths and paint spray booth systems are applications commonly used in the aerospace, industrial manufacturing, and finishing industries, among others. But, because paint processes involve flammable materials, certain care must be taken to prevent fires. In 2014, an explosion and fire at a restaurant furniture manufacturer in Heyburn, ID, demonstrated the potential dangers. Investigators isolated the source of ignition as a short in a lighting ballast in one of the Legend Seating Company’s on-site spray paint booths. Though nobody was injured, damage estimates exceeded $250,000. Most paints are either oil-based or water-based. Because they contain a high level of solvents, oil-based paints are considered flammable per OSHA. But, some water-based paints may also be dangerous. Manufacturers supply Safety Data Sheets (SDS) for all chemicals they sell, including paints. The SDS relays important information for safe usage. Section 2 describes its hazards, including its classification. Section 7 provides guidance for safe handling and storage. Section 9 details the physical and chemical properties of the material. A fire-rating refers to a type of building construction, which is resistant to fire for a certain amount of time. These buildings allow more time to evacuate the area in case of a fire. Emergency personnel also have more time to extinguish a fire before it spreads. Use 2-hour fire-rated buildings to store flammable and combustible paints between 30 and 10 feet of an occupied building. Use 4-hour fire-rated buildings to store flammable or combustible paints within 10 feet or less of an occupied building. Store flammable or combustible paints in non-fire-rated storage buildings if they are more than 30-feet from occupied buildings. Under these conditions there is no risk to the safety of personnel if a fire breaks out. Note: Always check with the local Authority Having Jurisdiction (AHJ) for clarity about local requirements for flammable paint storage. The temperature of paint in storage is important. Controlling it protects both its quality and its performance consistency. Flammable paint storage buildings are sometimes directly connected to spray booths. A constant paint viscosity is critical for ensuring a consistent quality finish. Temperature fluctuations affect paint viscosity and the quality of the finished paint job. The paint itself is also affected by temperature extremes. Overheating paint destroys some of its chemical properties and renders it useless. Freezing paint separates it into its constituent parts. This creates a risk of inadequate mixing during use. U.S. Chemical Storage supplies climate control options for paint storage buildings. These include heaters, chillers, HVAC units or a combination. Automatic temperature controllers help maintain temperature differentials regardless of internal or external conditions. Alarms also notify operators of temperature variations from the set point. A wide variety of racking and shelving options are available for paint storage buildings. These include multi-tier gravity sliding pallet racks, cylinder racks and drum racks. Shelves are available for smaller containers. Regulations require flammable paint storage buildings to have explosion relief panels in certain conditions. For instance, mixing paint generates flammable vapors. These have the potential to cause an explosion when ignited. Explosion relief panels create a path, directing the force of an explosion away from personnel. They help minimize the risk of injury. In addition, IBC Table 414.5.1 requirements specify NFPA 69 or explosion relief panels be used when storing and dispensing Class 1A materials as well as dispensing Class 1B materials. There are two main fire protection features of flammable paint storage buildings – fire suppression and mechanical ventilation. Fire suppression systems automatically discharge dry chemical or water as an extinguishing agent in the case of a fire. The purpose is to put out a fire as soon as it is detected, thus limiting its damage. Alarms notify operators upon activation. Peripheral equipment like heaters, HVAC units and ventilation systems all shutdown automatically when dry chemical suppression is used. Mechanical ventilation uses a fan to remove air from the flammable paint storage building and replace it with fresh air. This prevents flammable vapors from accumulating to create an explosive atmosphere. Flammable paint storage buildings are custom-designed and built for your application. Many companies have more than one type of chemical or container stored in each building. Some companies keep flammable paint waste in their storage buildings too, while waiting for safe disposal at an approved site. Just remember to heed basic safe chemical storage precautions. Avoid storing incompatible materials near each other. A release of one may cause the other to ignite. For example, oxidizers release oxygen and may accelerate a fire. U.S. Chemical Storage manufactures custom paint storage buildings to the customer’s size requirements. Regulations allow chemical storage buildings of up to 1,500 square feet. Modular buildings may be used when a larger footprint is necessary. U.S Chemical Storage has extensive experience in bulk paint storage applications. Our experts help you design the best solution for your needs depending on regulations, site layout and intended use of the facility. Learn more about our paint storage buildings here.